Anti-Human rights lobbying in Europe: meet some active campaigners! Help us protect people and freedom in Bangladesh! On 7 April, after rushing through Parliament a law rendering the functioning of one of Hungary’s most successful universities, the Central European University, impossible, the Hungarian government tabled a new law regulating NGOs which aims at stigmatising NGOs that receive funding from aborad. This bill that is unprecendeted in Europe (but exist e.g. in Russia) is a new element of the Hungarian government’s campaign to discredit those entities in the country who believe in and try to promote European values. It is reaction to these development that the coordination of European NGOs, Civil Society Europe, issued today a statement of solidarity to Hungarian NGOs. The EHF signed up to this document and encourages any other NGO to the same. This can be done on the following address: http://bit.ly/2p9GiEc. As for citizens, the organisation proposes an easy way to support the ongoing struggle of NGOs in Hungary: following this link, they can overlay a support message onto their Facebook profile picture. We stand in solidarity with you! We, representatives of European civil society, hereby express our solidarity with the Hungarian NGOs who were most recently targeted by the bill on the “transparency of organisations receiving foreign funds”. At the same time we wish to express our deepest support for the people who have taken the streets of Budapest to protest against this renewed attack on basic freedoms in Hungary. The legislative proposal that was tabled in the Hungarian parliament on 7 April would force NGOs receiving more than € 24,000 per year from outside Hungary to register as “civic organisations receiving foreign funds”. This includes funding from EU sources not managed by a Hungarian institution. This would effectively stigmatise any organisation that receives such funding. launched national consultation ‘Let’s stop Brussels’. The questionnaire accuses international NGOs operating in Hungary of interfering “in internal affairs […] in a non-transparent way” and of inciting “illegal immigrants […] to commit illegal acts”. The current legislation regulating civil society organisations already provides sufficient mechanisms for guaranteeing that these organisations conduct their work in a transparent, lawful and accountable manner. If accepted in its current form, the new bill tabled by the government would be unprecedented in a European Union member state. It would also severely constrain the space of action of independent civil society organisations at a time when other checks and balances have been significantly weakened in Hungary. Civil Society Organisations should have the same right to operate freely and independently in fundraising and projects as prescribed in International Human rights law and also in line with article 11 of the EU Treaties. Based on these concerns, we call on the Hungarian government to withdraw the bill. Rather than stigmatising NGOs with an unnecessary and harmful piece of legislation, we urge Hungary’s leaders to support NGOs which work for the well-being of society. on the European Parliament to adopt a resolution urging the Hungarian Government to withdraw the bill on NGOs following its debate on the situation in Hungary on 26 April, condemning firmly this law and demanding to withdraw it. on the European Commission to use as announced by the College of Commissioners all instruments at their disposal to uphold EU values as enshrined in article 2 of the EU treaties. on the European Council to engage with concrete steps by similarly applying pressure on the Hungarian government. on all EU institutions to adopt a consistent and systematic monitoring of the state of fundamental rights and democratic values in EU member States in a period when these rights are being undermined by several governments. This can only be achieved through an inclusive and transparent process and with the full involvement of civil society organisations and the citizens they represent. 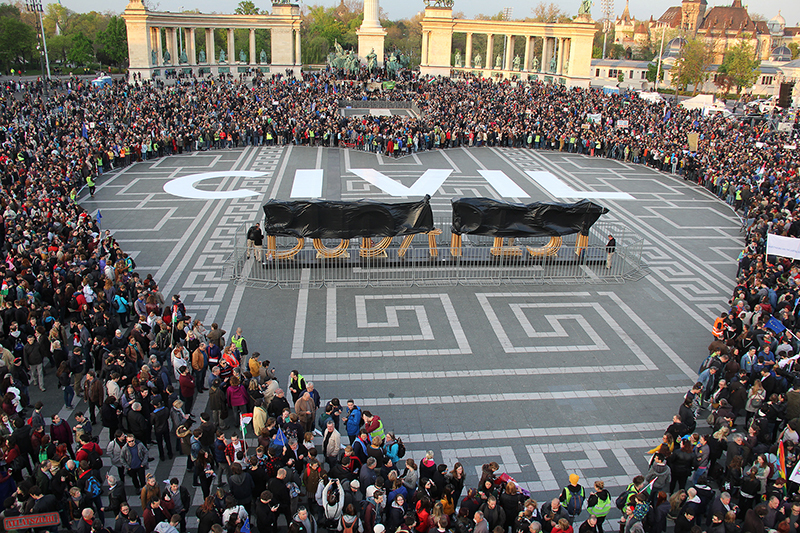 We stand in solidarity with you – civil society actors and human rights defenders in Hungary and elsewhere. The further shrinking of civic space in Europe can no longer be tolerated. Together, we will work to create a Europe that truly respects human dignity, freedom, democracy, equality, the rule of law, and human rights, including the rights of persons belonging to minorities in a society in which pluralism, non-discrimination, tolerance, justice, solidarity and equality between women and men prevail. Will the European Parliament resist the institutionalisation of religious lobbying?